A recognized name in the industry, Salon Verve recently celebrated a decade of hairstyling in style at its Maple, Ont. location. Over 200 people, which included loyal clients, colleagues, friends and local business owners, mingled over wine, cheese, appetizers and a dinner buffet in a chic setting with cruiser tables and dramatic candelabras. Winning North American Salon of the Year at the NAHA awards and the Canadian Salon of the Year at the Contessas in 2005, the salon is proud to announce that its latest expansion has doubled its number of hairdressing chairs. 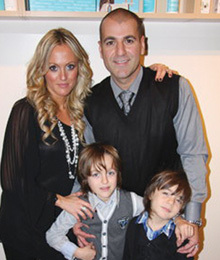 While working at a bustling salon in Toronto in the late ’90s, Lenny Ferri met makeup artist Sabrina, who shared the same vision to bring that downtown verve to the city of Vaughan. Not only were they cutting their wedding cake a few years later, they were also cutting the ribbon at the grand opening of their new venture, appropriately named Salon Verve.